Just as adults, children can suffer from psychological problems. These may be considered to be behavioral, mental, emotional or learning disorders. Treatments exist for each type of disorder and a mental health professional can determine if a child indeed has a particular problem. Many psychological problems cycle with periods of worsening followed by periods of improvement. Some issues resolve while others persist through adulthood. Prompt diagnosis and appropriate treatment increases the likelihood of successful management of these disorders. Depression may begin in childhood, particularly if the child has close biological relatives who suffer depression. Depression is often marked by a lack of interest in activities, sadness and exhibition of poor self-esteem. Bipolar disorder, a disorder in which periods of depression cycle with periods of mania, can also become apparent by late childhood. Depression and bipolar disorder occasionally lead to suicide attempts, and parents must monitor the child as well as seek appropriate treatment. Therapeutic techniques for these disorders involve medication and counseling. Autism is a pervasive disorder in which the child does not communicate at the same level as her peers and may show little interest in contact with others. She may have learning difficulties and become focused on a rigid routine and particular objects instead of showing interest in new things. Autistic children often have particular mannerisms, such as flapping their hands and an exaggerated startle response. While no medication directly treats autism, treatment and a specialized learning environment can maximize the child's potential. The American Academy of Child and Adolescent Psychiatry describes conduct disorder as a mental illness in which the child encounters difficulty behaving in the way that is expected of him. He may run away from home, steal, set fires, destroy property or harm animals, siblings or peers. This serious disorder requires treatment that may include medication, counseling and behavioral management. Children can experience a variety of anxiety disorders, including generalized anxiety disorder, panic disorder and obsessive-compulsive disorder. According to the Substance Abuse and Mental Health Services Administration, these disorders are characterized by significant fear and uneasiness that lasts for a month or longer and affects the child's quality of life. Treatments include medication and counseling. Older children may fall into substance abuse and addiction. Substances commonly abused include alcohol, marijuana and prescription drugs, among other drugs. Inhalants such as gasoline, paint, glue and solvents are also used for getting "high." Some children become psychologically or physically addicted to substances and require treatment for recovery. Parents must become familiar with signs of substance abuse. Common treatments include counseling and inpatient hospitalization. Some children fall victim to eating disorders, including anorexia nervosa and bulimia. Typical symptoms are being underweight, feeling she is fat even when she is thin, obsession with counting calories, and frequent excuses for not eating. Treatment for eating disorders usually involves counseling. 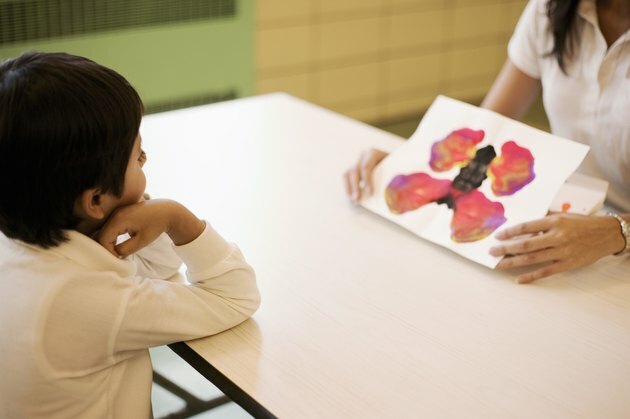 Attention-deficit hyperactivity disorder is suspected when a school-aged child has difficulty focusing on homework, paying attention in class, sitting still, staying in line or waiting his turn to speak. This disorder is frequently treated with medication and occasionally with behavior modification. Some children have difficulty learning at the same level as their peers. It may help to determine how the child learns best. For some children, reading is easier for them, while other children benefit from a visual demonstration. Still others work best by having hands-on learning. Testing is required to determine the specifics of the disorder and develop a specialized learning plan. This psychotic illness may strike children during their late school years. Early manifestations may include withdrawing from friends, developing unusual speech patterns, seeming to have no emotions, acting peculiar and elevating suspiciousness. Schizophrenia is commonly treated with medication and may require periods of hospitalization.